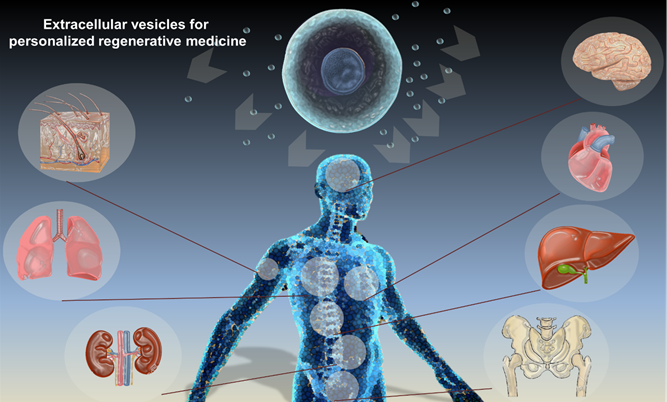 Laboratoire Matière et Systèmes Complexes - Soutenance de thèse : Max Piffoux ; vendredi 21 septembre 2018 à 14 heures, "Physical and interdisciplinary approaches of the extracellular vesicle field : new tools and techniques toward clinical translation in regenerative medicine and drug delivery"
Accueil du site > Séminaires > Archives soutenances > Soutenances 2018 > Soutenance de thèse : Max Piffoux ; vendredi 21 septembre 2018 à 14 heures, "Physical and interdisciplinary approaches of the extracellular vesicle field : new tools and techniques toward clinical translation in regenerative medicine and drug delivery". Thèse de Max Piffoux co-encadrée par Florence Gazeau, Amanda Brun et Claire Wilhelm. Soutenance le vendredi 21 septembre 2018 à 14 heures. Lieu : bâtiment Halle aux Farines, Salle 234C. Extracellular Vesicles, encompassing exosomes, microvesicles, apoptotic bodies are nanosized vesicles secreted by most cells of the organism, that demonstrated physiologic and physio-pathologic roles in various processes like hemostasis, metastasis, information transfer through biological macromolecules or more recently in inflammation resolution in regenerative medicine. Therapeutic use of these EVs, in particular as drug delivery systems or as a regeneration triggering agent is of a major interest, for example the use Mesenchymal Stem Cells derived EVs after myocardial infarction or stroke. EV recapitulate their parental cell effect and benefit from unique opportunities like off the shelf availability, low immunogenicity and no anarchic differentiation or pulmonary embolism. However, major obstacles are still to be faced in the field, like the EV drug loading, engineering, targeting, characterization, delivery method and GMP high yield production toward clinical translation. We developed new methods to respond to these needs at the crossroad of biology, physics, pharmacy and medicine, and discovered meanwhile that some of these techniques can be used in other fields and indications. As an example, a new liquid cell transmission electron microscopy labeling method was used to investigate live in situ at the nanoscale level EVs behavior, and can be used for other “soft” materials like liposomes of biology processes. The PEG induced liposome/EV fusion method was designed to produce biological/synthetic hybrids with engineered membrane properties and drug loading. A first response to the production problem was made designing a microfluidic chip allowing shear stress application to trigger EV production. The concept of shear stress triggered EV release was also used in the design of 2nd generation system for high yield, scalable and compliant with Good Manufacturing Practice, EV production method that uses a controlled shear stress to induce EV secretion. These EVs were tested in regenerative medicine models of fistula healing and chronic heart insufficiency confirming the interest of a new local delivery method using thermosensitive gels and their potency compared to parental cells. Our team is now exploring the scale-up, immunogenicity, and stability of these EVs and benchmarking their cost/efficiency in various models to pave the way toward the democratization of EV-based regenerative medicine through a company/platform creation.